Watch the stars arrive at the O2 Arena and greet fans and photographers ahead of their performance at the 2011 Jingle Bell Ball. 2. 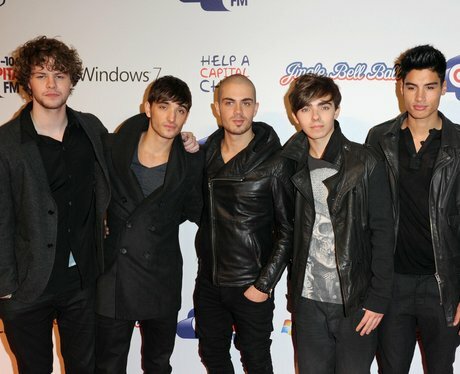 The Wanted pose on the red carpet before heading off to their dressing rooms to prepare. 3. Pixie Lott turns up at the O2 Arena and gives photographers a smile ahead of her performance. 5. Pixie Lott has fun on the red carpet before heading off to her dressing room to prepare for tonight. 7. Calvin Harris poses for photographers on the red carpet inside the O2 Arena. 8. 'Earthquake' singer Labrinth arrives at the O2 for his 2011 Jingle Bell Ball performance. 9. Labrinth was all smiles for photographers on the red carpet, before heading off to wardrobe. 10. Pixie Lott hung around on the red carpet to welcome The Wanted boys to the O2 Arena. 11. Tom from The Wanted will join the boys on stage for perfomances of 'Glad You Came' & 'Lightning'. 12. Siva from The Wanted strikes a pose on the red carpet before heading to wardrobe.